Last night, US Navy SEALs boarded an oil tanker in international waters southeast of Cyprus. The ship, the Morning Glory, which is flying under the North Korean flag, took on oil at the port of As-Sidra in Libya on March 8th. The oil was loaded onto the ship by a militia seeking greater autonomy for the country’s eastern portion, Cyrenaica. The oil was proprety of the Libyan government’s The North Koreans have denied any connection to the vessel and have since canceled its registration with their country. 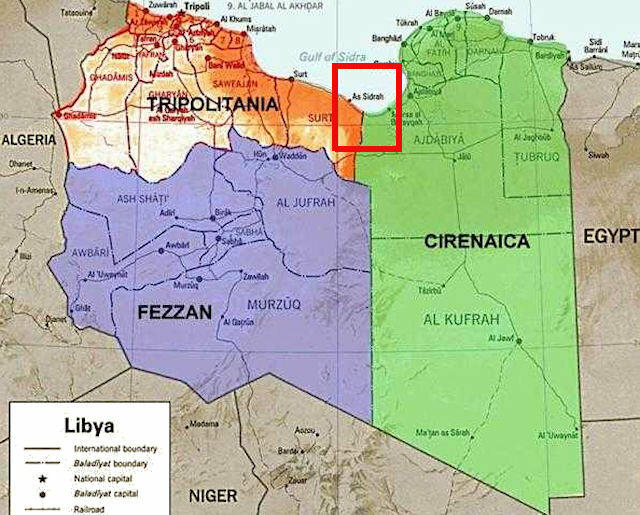 A map showing the regional divisions of Libya, with Tripolitania in the northwest, Fezzan in the southwest, Cirenaica (Cyrenaica) in the east. The port city of As Sidrah (As-Sidra), which is close to the boundary between Tripolitania and Cyrenaica, is highlighted. The incident is the latest in a series of serious confrontations between Libya’s fragile government and militias who continue to operate with virtual autonomy in various areas of the country. Libya’s Prime Minister Ali Zeidan had said the country’s navy had prevented the tanker from leaving the area last Monday. The tanker actually evaded capture and moved further into the Mediterranean Sea. Libya’s parliament responded by ousting Zeidan in a vote of no confidence. Separatist militiamen have been in control of As-Sidra’s oil terminal since last July. The hope is that the US raid will act as a deterrent to future attempts to export the oil independently. 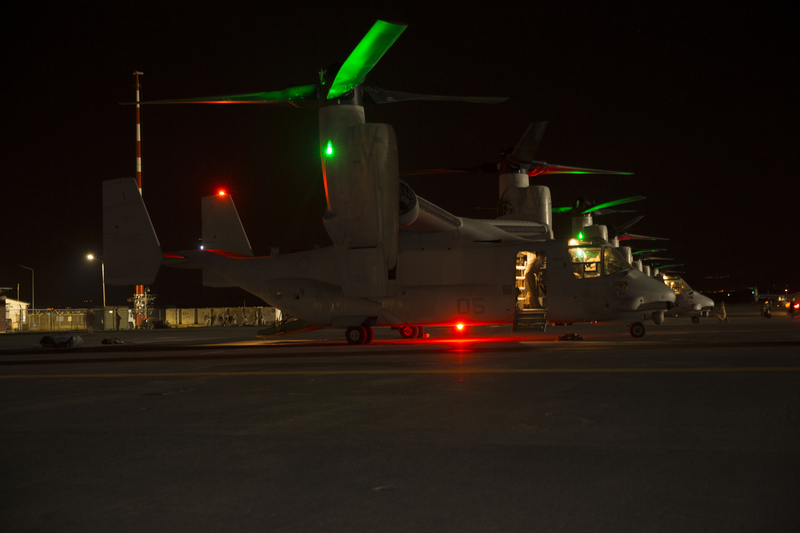 The operation, reportedly conducted at the request of both the Libyan and Cypriot governments, is part of a noticeable uptick in special operations forces raids on the continent. Last October, a raid was launched into Libya that resulted in the capture of Abu Anas al Libi, wanted in connection with the bombing of Pan Am flight 103 in 1988, as well as other terrorist attacks. Navy SEALs attached to Special Operations Command Europe (SOCEUR) reportedly conducted the raid, which was launched from the USS Roosevelt, an Arleigh Burke-class destroyer. The SEALs took control of the ship from Libyan rebels, but a team of sailors from the USS Stout, another Arleigh Burke-class destroyer, will supervise the transit of the tanker back to Libya. There was no official information on what SEAL team was involved in this operation, but the use of the word “attached” suggests that they may have come from outside of Europe and then been placed under the operation control of SOCEUR’s Naval Special Warfare Unit Two (NSWU-2) for the actual mission. It is also worth noting that the decision was made to place the SEALs under the control of SOCEUR rather than Special Operations Command Africa (SOCAFRICA) and its assigned Naval Special Warfare Unit Ten. SOCEUR and SOCAFRICA are both located in Germany. 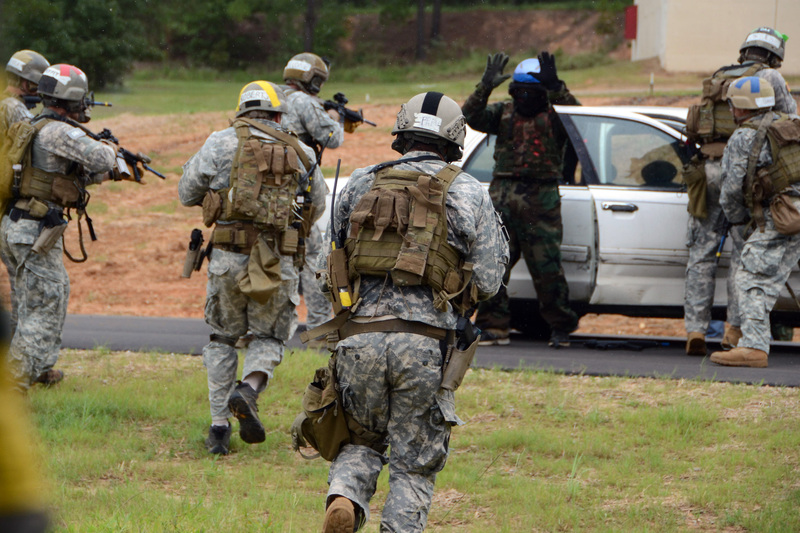 Providing assistance to national security forces has long been one of the key elements of international assistance to developing nations broadly. The basic concept is that professional militaries and police forces can help instill a sense of confidence in governments, making them more stable as a result. The stability in turn promotes development in other areas. Essentially, more security equals more stability, when in turn equals more development. This is definitely the goal behind the announcement last year to work on the development of a so-called “General Purpose Force” in Libya, where the central government has been largely ineffectual following the ouster and killing of the country’s former leader, Moammar Gadhafi, in 2011. The various militias in the country that helped overthrow the previous regime continue to hold significant power, especially at the local level, and act with relatively impunity. In addition, the lack of a functional national security apparatus has meant that much of the country has slipped into what might be described as an under-governed state. Concerns about terrorists using these regions to establish bases of operation have been voiced by Libya’s neighbors, as well as partners farther afield. Last week, Libya’s interm Prime Minister Ali Zidan said that almost eight hundred personnel had either been sent to Europe recently or were on their way as part of the new General Purpose Force effort. Four hundred had already deployed to Turkey, and another four hundred were to go soon to Italy. Another four hundred are scheduled to eventually travel to Britain. In total, some eight thousand Libyan personnel are expected to go through twenty-four week training programs in Europe, with additional support provided by the United States. Zidan also said that there are currently some five thousand Libyan personnel around the world receiving training. 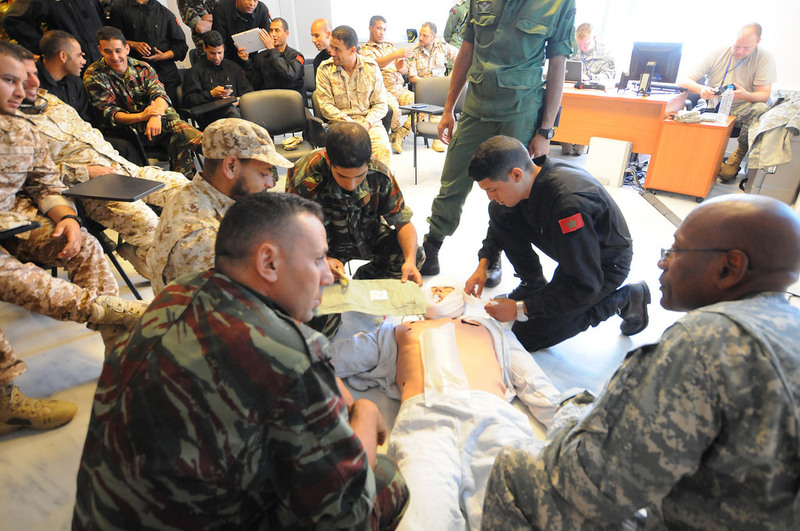 Countries providing training for Libyan forces were said to include Algeria, Britain, Germany, Italy, Morocco, Persian Gulf states, Pakistan, Turkey, and the United States. Also last week, Maritime professionals from West Africa, Europe, South America, and the United States met in Lagos, Nigeria to finalize the exercise plan for this year’s iteration of Obangame Express, a US maritime cooperation exercise held in the Gulf of Guinea. Angola, Belgium, Benin, Brazil, Cameroon, Cote d’Ivoire, Denmark, Equatorial Guinea, France, Gabon, Germany, Ghana, Italy, Netherlands, Nigeria, Portugal, Republic of Congo, Sao Tome & Principe, Spain, Togo, Turkey, and the United States will participate in Obangame Express 14, which is the fourth iteration of this exercise. The exercise is designed to help improve regional capabilities to deter piracy and drug smuggling, as well as other maritime contingencies. As the threat of piracy has reduced in the Gulf of Aden off Somalia, attention to the problem has turned to the Gulf of Guinea, where it remains a serious issue. Last November, the were reports of a proposal to base US Marines afloat to help address the problem. Today, the German government announced its intention to contribute troops to the European Union training mission in Somalia. Germany had previously been involved in the training of Somali security forces when the EU mission was located in Uganda. 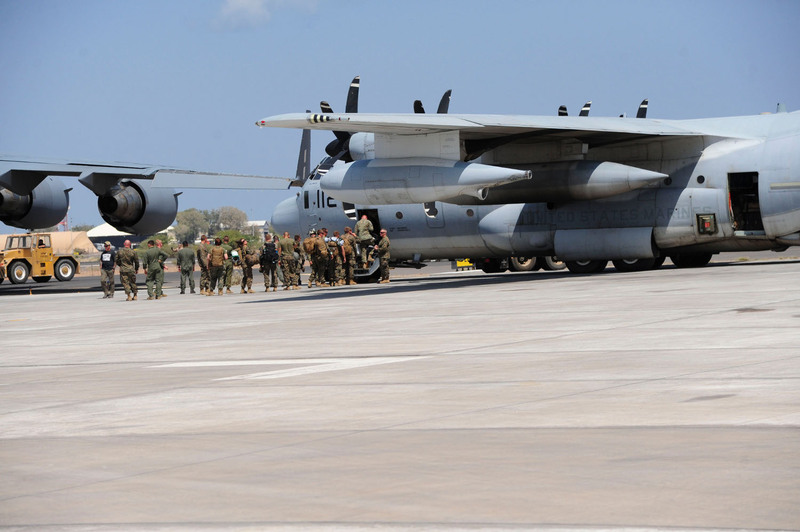 When the EU moved the operation to Somalia’s capital Mogadishu last May, the Germans dropped out of the program, citing the increased risk of operating there. The EU had relocated the program as a gesture meant to affirm its support for the central government in Somalia. Germany, which has some five thousand personnel taking part in nine international missions, has been urged recently by other European powers, notably France, to become more involved in such efforts. The bulk of Germany’s international commitment is its three thousand personnel in Afghanistan as part of NATO’s International Security Assistance Force. Last week, Germany also announced it would be increasing the size of its contribution to international peacekeeping efforts in Mali. These announcements potentially signal a change in German foreign policy, which has since the end of the Second World War traditionally been inclined to avoid international commitments where there is a significant potential for violence and casualties. This month, Foreign Minister Frank-Walter Steinmeier, said earlier this month that “Germany, with all its diplomatic, military and aid capacity cannot stand by when its help is needed”. Steinmeier is a member of the country’s Social Democrat party, which entered into coalition with the conservatives led by Chancellor Angela Merkel. It has been suggested that this new coalition has been instrumental in these changes in German foreign policy. Since the ouster and execution of Gadhafi in 2011, Libya has suffered from chronic instability as various militias continue to operate with impunity. The US, France, and other countries provided materiel support to various armed opposition factions, along with a sustained air campaign that allowed them to take control of the country. The new central government has largely failed in its attempts to get these factions under control. For instance, four Egyptian diplomats were abducted last week in what was said to be a reprisal for government action against a prominent militia leader. Terrorism is indeed a growing threat in Libya. The US Department of State designated two groups in Libya as both Foreign Terrorist Organizations (FTO) and Specially Designated Global Terrorists (SDGT) last month. Militant groups have also looted Libya for weapons, with man-portable surface-to-air missiles being among the weapons thought to have been taken. Efforts to train Libya’s national security forces to respond to these threats are scheduled to begin this year. The potential threats posed by absence of government control in Libya is well known. 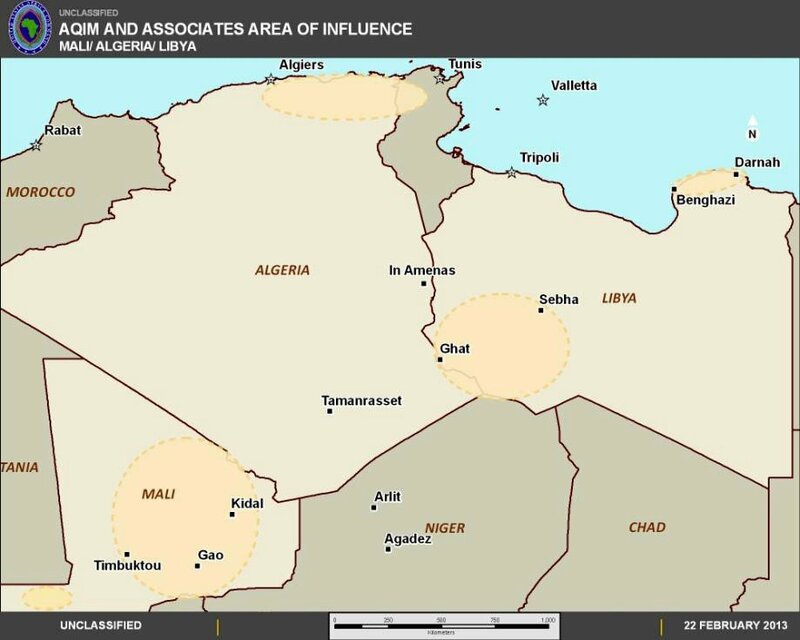 Tuareg insurgents in Mali were originally located in Libya and Al Qaeda in the Islamic Maghreb have also used Libyan territory as a staging ground for attacks in neighboring countries. Niger has already been involved in increasing international precense to counter such activities in the region. Both the US and France conduct drone reconnaissance operations from the country. However, the US so far has declined to deploy significant numbers of troops to the region, preferring to support other countries and otherwise rely on unmanned aerial vehicles and special operations forces to conduct raids on isolated targets. France is also finding its military strained by interventions in Africa, despite having a clear interest in expanding its ability to respond to threats on the continent. Its primary focus has shifted to Central African Republic, with the hope that other European nations will be able to assist in countries like Mali. The Netherlands recently began deploying peacekeepers to that country, and Germany announced today that it would look to increase its training mission there.